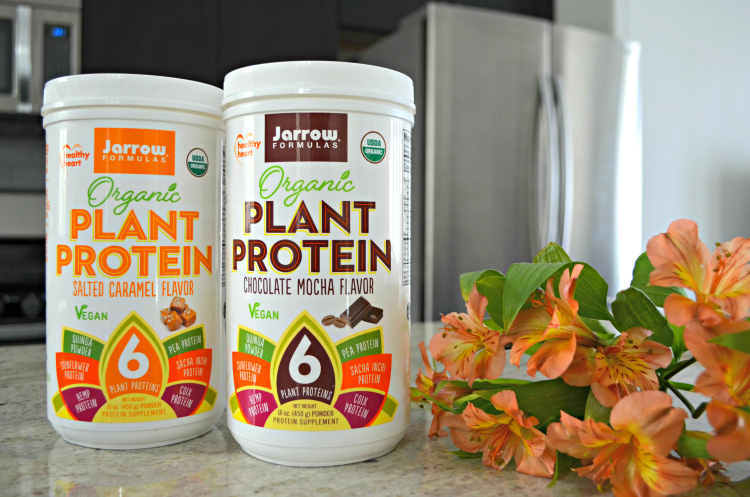 Jarrow Formulas sent me their latest Organic Plant Protein, a great vegetarian and vegan alternative to the standard protein powders made of milk-based proteins like whey and casein. A scoop of the powder contains 18 grams of protein and is a quick and easy way for me to get a pre-workout meal in. The organic sources of plant protein include quinoa, sunflower, hemp, pea, sacha inchi, and coix, which all provide a complete amino acid profile! The Organic Plant Protein comes in three flavors, and the Salted Caramel and Chocolate Mocha are delicious, even with a little almond milk. Plus, it is free of gluten, added sugars, and GMOs! Here is a concoction that I like to make with Jarrow Formulas Organic Plant Protein in my favorite flavor, Salted Caramel. I add a few extra ingredients to the mix, so that my body gets an adequate amount of calories, protein, and carbohydrates for my workout! Add all the ingredients together into a blender. This powder can be found in local health food stores and online at Lucky Vitamin.com. Always fuel up! Sponsored post: Although I was given the product, all opinions are my own.